Huawei has launched Huawei Nova 3 in India which comes with Four AI Cameras, Notch Display & Kirin 970 processor. 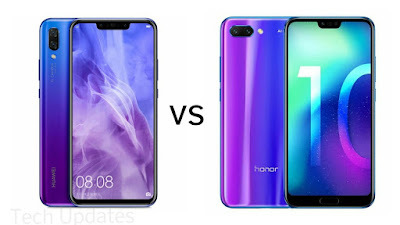 Check out Price, Specs, Features comparsion between Honor 10 and Huawei Nova 3. Both Phones comes with Glass body. Huawei Nova 3 has Fingerprint Scanner on the Rear Compared to Honor 10 which has on front. Nova 3 features a 6.3-inch (2340 x 1080 pixels) Full HD+ 19:5:9 3D curved glass display whereas Honor 10 has smaller 5.84-inch ( 2240 x 1080 pixels) Full HD+ LCD 19:9 display with 2.5D curved glass. Both phones are powered by Octa-Core Huawei Kirin 970 processor coupled with 6GB RAM and 128GB of internal storage, Nova 3 comes with Hybrid SIM slot which lacks with Honor 10. On Camera Huawei Nova 3 has 16-megapixel rear camera AI scene recognition that can detect over 500 scenes and the 24-megapixel secondary rear camera for portrait shots. It has a 24-megapixel front camera along with a 2-megapixel secondary camera whereas Honor 10 comes with16MP (RGB) primary camera with LED flash, secondary 24MP (Monochrome) rear camera, f/1.8 aperture, depth focus, PDAF and 24MP front-facing camera with f/2.0 aperture. Honor 10 has 3400mAh battery compared to 3750mAh Battery on Huawei Nova 3.